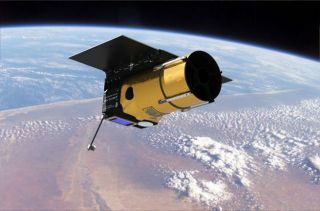 Artist's concept of the Arkyd space telescope being developed by asteroid-mining company Planetary Resources. A Kickstarter campaign in 2013 raised more than $1.5 million toward the telescope's development. Spaceflight is going to the masses. Private companies, nonprofit institutions and individual citizens are increasingly looking to bankroll their space-themed projects via crowdfunding campaigns, some of which have been incredibly successful. Another Kickstarter campaign — launched by a group called Lunar Mission One, which wants to send a robotic spacecraft to drill deep into the rocks near the moon's south pole — received more than $1 million in pledges last year. And the nonprofit Planetary Society has raised more than $815,000 to date during its ongoing Kickstarter effort for the second mission of its tiny LightSail spacecraft, which is scheduled to perform a solar-sailing trial in Earth orbit next year. Such success stories make sense, given the passion many people have for spaceflight and exploration, Kickstarter representative David Gallagher said. "A lot of Kickstarter projects are about making a device or a film, and if you support the project, you get a smartwatch or some kind of physical object," Gallagher told Space.com. "The space projects are often not so focused on that," he added. "They often have great rewards for the backers who support them, but they are really so much more about the journey, in a literal sense, and about participating in something that people had not been able to participate in before." Space projects remain just a tiny fraction of the total number of campaigns on all of these websites (though not on Fiat Physica, which launched last year specifically to aid physics and astronomy research). Indeed, of the more than $1.75 billion pledged to about 235,000 Kickstarter projects to date, a total of just $9.7 million has gone to 185 space-related campaigns, company representatives told Space.com. But space projects' share of the crowdfunding pie will likely grow in the coming years, Gallagher said, citing the increasing influence and technological advancement of relatively inexpensive "cubesats" such as LightSail, which can accomplish big things despite their small size. Cubesats offer a "way for academics, college students and anyone to take part in experimenting and just learning about space and trying new things," Gallagher said. "The wider you can open this up, the more ideas get to be tested out."